Riley Bloom died, aged twelve, in a car crash with her parents and her beloved dog Buttercup. Her sister Ever survived – but that’s another story. Riley must let go of Ever and all the things that tied her to life – and discover what she’s meant to be in the afterlife. Riley is a soul catcher. That means helping the unhappy lost souls who stick around in the human realm to move on – and find their own place, over the bridge, in the great hereafter. With her spirit guide, Bodhi, and Buttercup by her side, Riley embarks on an adventure that will take her around the world – sending ghosts back where they belong, until she can finally make it there herself. 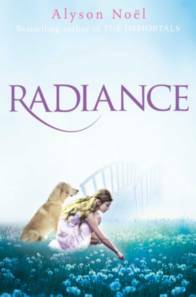 Radiance is an amazing novel that gripped me from the moment I started reading, and within hours I had devoured it. The perspective of the novel is very different but one that young teens can relate to. I always wanted to know more about Riley, so when the book came out I was jumping to get it. I am glad I did and do not regret it for it is one of the best reads ever, and I cannot wait for Shimmer. I was particularly fond of chapters 1 and 2 and their introduction on death. I think it is a fantastic opening to the book. The fact that Riley is only twelve is a nice twist to the YA series as characters in YA novels are generally 16+. I think many of the younger YA readers, like me; will love the series as there are more ways to relate to the characters, from the language of the characters to the general way of thinking. Noel has done an amazing job of putting herself into a young teenagers mind. I love how Riley develops through the book and how we see an all new side to her personality than the party girl that is shown in the Immortals series. You get to see the true colours of this teenage girl who has lost everything, misses everything and is being forced to choose between her family and her sister, which brings me to the point of Reality. I think this scenario helps many teens to connect with Riley as there may have been divorces in their family. Anyway, then Riley is thrust into a new world and within hours is sent off to Soul Catch. The ideas in the book are unique and the dimension of Here & Now is one of my favourites. The magic is to the right balance, so that it is not thrown off as a children’s book but not a complete horror novel. Noel has found a perfect balance and to be honest the novel is absolutely perfect; beautifully written, utterly enticing, Noel’s novel is glowing with Radiance. The characters are all very realistic and are all instantly likable. My personal favourite was Buttercup but seeing as he was a dog my second is Riley. She has a really quirky, but fun and playful personality and although she may be annoying at times you can’t help but like her. I think this is shown particularly well from the way Riley and Bodhi act around each other. I loved the events in the book. They slotted perfectly into the storyline and made it interesting. My favourite scenes were the ones in which Riley faces the snake headed clown-dentist and the one in which Riley, Buttercup and Bodhi are flying and Riley finally gets her glow. I find the scene touching and it gives a suspicion of a growing romance between Bodhi and Riley. The storyline is perfect. There were no glitches or parts that made no sense and I think Noel had planned the book out carefully in such a way it is the perfect spin off series to the Immortals series. Overall the book is instantly loveable and will always be a favourite of mine and I will most defiantly recommend it to all, so a well done to Noel for creating, yet again, another five start novel. This sounds really interesting...sometimes afterlife books are cheesy. I'll have to check this one out.